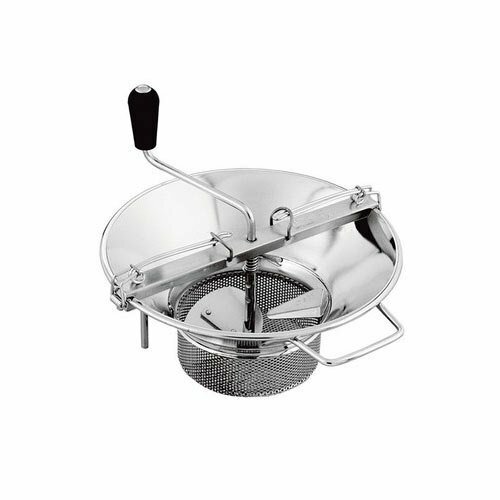 This Tellier X5 14" diameter stainless steel food mill is used to puree and mill tomatoes, apples, carrots, potatoes, fruit sauces, soups and much more. Simply place the cooked fruits or vegetables in the mill and turn the crank! The semicircular blade sweeps, compresses, and scrapes the food, while the bar applies constant pressure against the cutting plate while retaining seeds, skin, and fibers. You can be sure this food mill is incredible durable. If you have any questions about this product by Food Mills, contact us by completing and submitting the form below. If you are looking for a specif part number, please include it with your message.